Why is everybody in Palm Beach Gardens going crazy for this sport? Think pickleball is only for the Velcro shoes-and-Bengay set? That it's reputation as a easy game for seniors makes it too tame for the CrossFit crowd? Not long ago, the former professional athlete turned athletic trainer held the same opinion about the racquet sport that's booming in popularity among retirees. "I thought it was slow, like shuffleboard, " said Ah-Yuen, 47, a former Tae Kwon Do world champion from Canada who trains top golfers on the PGA tour. "I needed a lot of convincing to try it." A year and a half after playing his first pick-up game, Ah-Yuen is not only a top-ranked pickleball player, he's sponsored by a major pickleball company and competing in the U.S. Open Pickleball Championships next week in Naples, the sport's east coast Mecca. "I just fell in love with it," said the Tequesta resident. "It's as competitive as you want it to be." This is no longer your grandfather's pickleball. Or even your father's. It's becoming your son's game. The world's acknowledged top doubles player is Kyle Yates from Ft. Myers, who just turned 23. 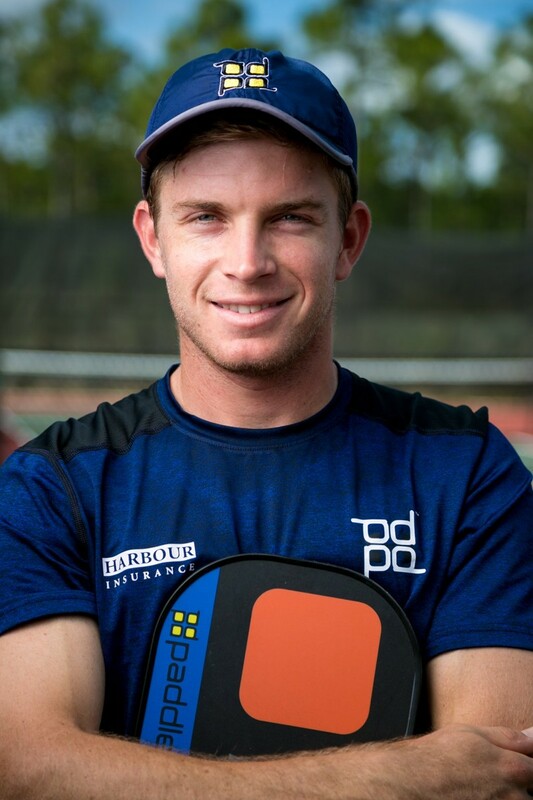 After dropping out of the University of Florida to play professional pickleball, Yates has traveled across Europe, Central America and the U.S., demonstrating his acrobatic trick shots and a savage pickleball forehand he says has been clocked at 90 mph. "When I started at 17, no one my age was playing it, but I didn't care," said Yates, before teaching a pickleball clinic earlier this month in Palm Beach Gardens. "I like how fast-paced it can get at this level. You're standing in front of someone 14 feet away playing at 70 mph." At that speed, the pierced plastic balls sting when they strike flesh. "We call the marks they make 'tattoos,'" said Yates. Pickleball, for those not yet seduced by the whimsically named hybrid of tennis, badminton and ping pong, is played with a paddle and a large Wiffle-style ball on a court about a quarter the size of a tennis court. Unique to pickleball is a no-volley zone called "the kitchen," that extends seven feet from each side of the net, the source of many faults. Learning is easy; mastering pickleball is not. Beginners can easily plunk the ball back and forth over the net, but finesse in "dinking," the precise, controlled shots in which the ball just clears the net, is the key to expert play, along with fast and furious returns. The game was created 50 years ago on Bainbridge Island, Washington, by a father trying to entertain his children. The "pickle" part comes from the boating world, where a pickle boat is the last boat in a race or the final boat of a fishing fleet to make it to port. The nation's fastest growing sport, according to the USA Pickleball Association, is hooking a rapidly increasing number of the 77 million Baby Boomers streaming into retirement. Bored with golf, disdainful of shuffleboard, and lacking the wind or joint health to bound around a tennis court, these active retirees adopted pickleboard with the same enthusiasm their younger selves flocked to skateboarding, surfing or skiing. "They found something they could do without beating up their bodies," said Chris Evon, executive director of the U.S. Open on Pickleball. "And there's a strong social element. You're out there having a good time." Last year, more than 2.8 million people played pickleball regularly, according to a 2017 Sports & Fitness Industry Association report, a 12.3 percent increase over the previous year. Retirement communities and sunbelt cities can't build courts fast enough to satisfy the sport's expanding fan base. Home builder Kolter just broke ground on what the company says is the largest private pickleball complex in South Florida, with 27 courts at its Verano community in Port St. Lucie, according to a spokesman. The Villages, the vast Central Florida retirement community, has 196 pickleball courts, according to its web site. In reponse to hundreds of requests for courts, Palm Beach Gardens converted two little-used roller hockey rinks into 12 pickleball playing fields. In total, the city has 24 courts; six of them indoors, with four more to be built soon, according to Tim Ford, the city's leisure services manager. "Four or five years ago, our staff would have to play just to make a foursome," said Ford. "Since then, the growth of pickleball here has been incredible. It's like nothing we've ever seen. At first it was the older folks, but now you'll see guys in their 20s and 30s out there playing." So many players clamored for Palm Beach Gardens' first-come, first-served courts that in November Ah-Yuen started the Pickleball Athletics Club in partnership with the city. The club rents courts for its members and Ah-Yuen matches players' skill levels to keep games competitive. Within 3 months, he had 200 members, some of whom drive from Vero Beach and Broward County to play organized pickleball matches. On a recent morning, 50 to 60 players had reserved playing times through the club. Ah-Yuen called out names of the foursomes before starting the club's weekly round robin tournament. "This is exactly what the community has been asking for," said Ford. But the biggest pickleball news is its elevation to a competitive sport. When Evon and Terri Graham started the U.S. Open of Pickleball in Collier County in 2016, they had 800 players sign up, making it then the country's largest pickleball tournament. "This year, we had more than 2,000 players sign up in three hours," said Evon. "We're shocked that in three years it got to this." Players from 47 states and 17 foreign countries have signed up to vie for $40,000 in prize money, while the week-long tournament from April 21-29 funnels an estimated $6 million into Collier County, according to Evon. Sensing a sports moment such as racquetball had in the 1970s, the women quit their jobs with Wilson Sporting Goods to concentrate full time on pickleball. Many of those playing at the pro level are ex-professionals in other racquet sports, such as squash and tennis. "This young group of players is changing the game," said Evon. "They're getting much more aggressive." Collier County volleyed the ball back, building 50 pickleball courts and a large event structure at the site of pickleball's U.S. Open in East Naples Community Park, where 10 more courts are under construction, making it the East Coast's pickleball headquarters. But even among the sport's older, casual picklers, the game has become a healthy obsession. "I can't tell you how many people say pickleball saved my life," said Evon. They tell me, 'I had heart attack and this got me off the couch.' It brings people together and gives them a new lease on life."